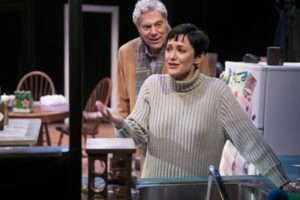 Expect nothing short of stellar acting when you see the Kansas City Actors Theatre production of David Hare’s “Skylight” now playing at City Stage on the lower level of Union Station. finds contentment is serving others, quite the contrast to Tom. 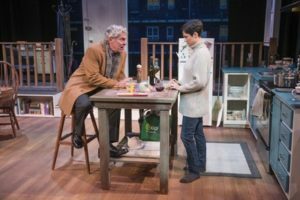 “Skylight” allows both actors to develop rich characterizations as the play’s energy transfers back and fourth between them. At one time Tom’s character reveals how he feels and why he feels that way, causing the audience to feel sympathy toward him. Then, Kyra expands on her perspective, quite opposite, and the focus shifts to her perspective. The back and fourth volleys keep the audience actively engaged with two opposing viewpoints. 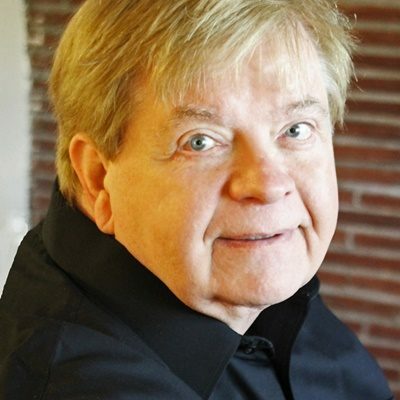 Tom, a restaurant owner, worked to develop successful restaurants and live a life of luxury. Kyra, stems from a working-class background and understands work, dedication, and service to others. The couple suffered an abrupt split after their six-year affair comes to the attention of Tom’s wife. 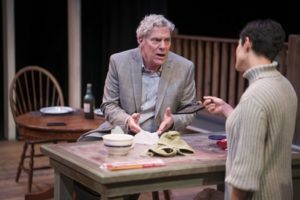 The play opens as Tom’s adult son, Edward, (Charlie Spillers) visits Kyra to try to understand what happened that caused Kyra to leave their family. Edward unfolds the situation of the family dynamics that provides the setup for the reunification of Kyra and Tom. 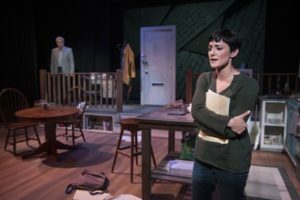 Even though the story sounds melodramatic and a typical “backstreet” relationship, the playwright’s dialogue and sense of characters creates an enjoyable premise for the play. Although the story involves a tug-of-war between the two principals, expect some funny, light moments as well. Rensenhouse and Karel balance each other’s performance and the chemistry between them is strong. You can tell, they feel comfortable in their parts and that their characters strike a perfect balance between their conflicting worlds. Spillers provides the fulcrum for the delicate balance. Although his part is small, his character makes the play work. For some reason, Kansas Citians give standing ovations at most shows–deservedly or not. “Skylight” deserves that special accolade. 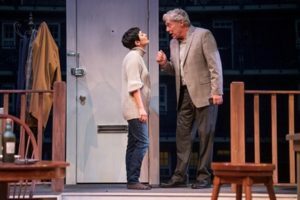 The entire production is sleek, rich, and deserving of audience praise. 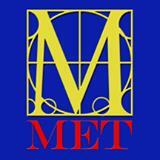 As with all KCAT productions, the behind the scenes crews add a level of excellence to their plays. The direction and casting from Darren Sextro excels. He chose perfect actors for his vision of “Skylight.” Sextro masterfully set-up the energy flow and movements to match from his actors. The production team for “Skylight” includes: Tyler Boyer, assistant stage manager; Kyle Dyck, technical director; Bret Engle, scenic designer; Kylor Greene, lighting designer; Alex Murphy, stage manager; Rosalee O’Gara, lighting intern; Sarah M. Oliver, costume designer; Jonathan Robertson sound designer/composer; Elizabeth Sampley, properties designer; Paige Stallings, wardrobe. 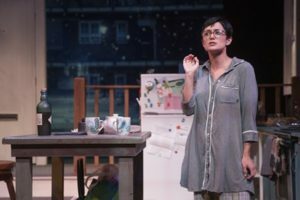 “Skylight” runs through June 10. 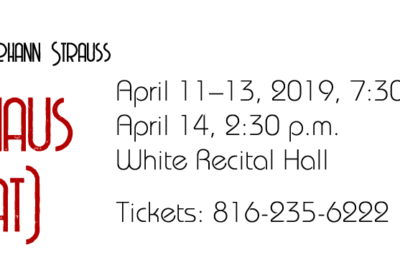 Tickets may be purchased through the KCAT website or by phone to the Central Ticket Office at 816-235-6222 to purchase tickets or exchange dates.